The 1971 movie, Fiddler on the Roof, captured my attention this afternoon. Undoubtedly I saw the movie decades ago but had forgotten the plot. I’m not well-versed in current world news; I only know what I hear and see on the television news. But I couldn’t help seeing the similarity between the events in 1905 Russia and 2014 Russia. Frequently we see broadcasts showing thousands of displaced persons. We see the conflict affecting Israel and Jewish believers–and adjoining countries and opposing religions. (Not that “luck” has anything to do with it?!?!) The computer crashed and is expensive to repair. ~~ Verizon keeps billing me for “Hot Spot” service I haven’t used (and I didn’t get satisfaction from four phone calls). 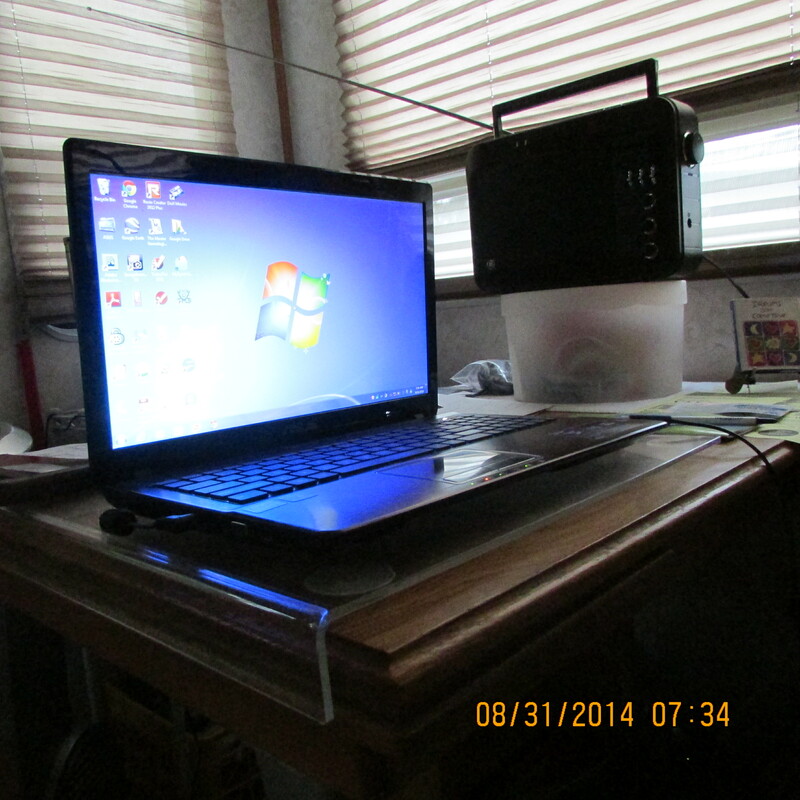 Remember, I put up a Yagi WiFi antenna so I pick up a free signal from the CARE Center. ~~ I’ve been walking a neighbor’s dog while he is away and the big dog left me with battle scars. No, no, she didn’t attack!! She was just so happy to see me she jumped… and her toenails left me bleeding and bruised!! …and my laptop crashed because it “was contaminated with many virus.” I gave the computer store owner the OK to “do whatever it needs.” I may have it back early next week. I’ve relied on my paid subscription to McAfee!! Just touching base; thought you might like to know the status. Despite the heat, I drove into Livingston for “thrift shopping.” The instructions were given last night–at the square dance–that we should have denim skirts or jeans, white shirt or blouse, and red neckerchief for club wardrobe. That will identify our club members when we do exhibition dances or visit another club. ~~ To my surprise, the Senior Center Thrift Shop had a “$4. per bag” sale. (The average size grocery bag.) I came home with two denim shirts, a denim jumper, denim shirt, and a long-sleeve white western shirt–for four dollars. That makes me very happy!! On impulse, heading home, I stopped at another thrift shop and asked about denim and/or western vests. “Not until the Winter clothes are on display” was the answer. On top of a pile of clutter, I spied a fabric closet organizer. Several “shelves” and dozens of pockets for shoes. I was told there was a second organizer buried beneath the clutter. I found it and bought both for $15. (I didn’t argue about the price. They are “new” and would be three times that price at Ikea.) They are much better than my makeshift storage in tote bags and oversize purses. That makes me very, very happy!! ~~ It’s a “work in progress” right now but eventually I’ll put shoes in the pockets and off-season hats, gloves, scarfs, etc., on the shelves. A pair of decorative salt and pepper shakers came home with me, also. 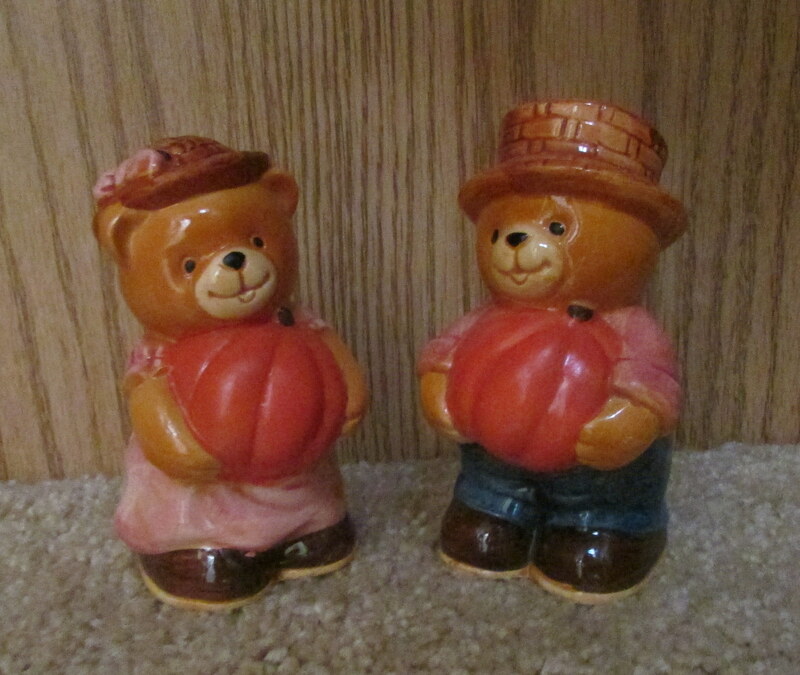 They would fit right in with my vast collection of salt and pepper shakers–if I still had them. Over two-hundred sets–collected over the decades–went to one son. I don’t know if he still has them… but (succumbing to a decades-old habit) I couldn’t resist the purchase. My collection was quite unique: “people shakers”: German, Scottish, Spanish, Mr. & Mrs. Santa Claus, etc. But the collection had/has Mr. & Mrs. Duck, Mr. & Mrs. Dog, Mr. & Mrs. Cat, etc. ; Aunt Jemima & Uncle Moe, Planter’s Peanut (man), and endless more. They were displayed in a special cabinet built by my father. ~~ So I’ve walked down “Memory Lane” and that makes me happy!! The hot humid weather has been an overworked topic of conversation on this blog. We’re experiencing triple digits and then add another eight to twelve degrees for “feels like” temperature. The only news worth reporting is the indoor projects accomplished. Pictures later. (I don’t have my laptop computer back yet so can’t upload pictures.) ~~ Today, I actually got out the sewing kit and mended a skirt!! Furthermore, all the clutter is off my bed for the first time in months!! 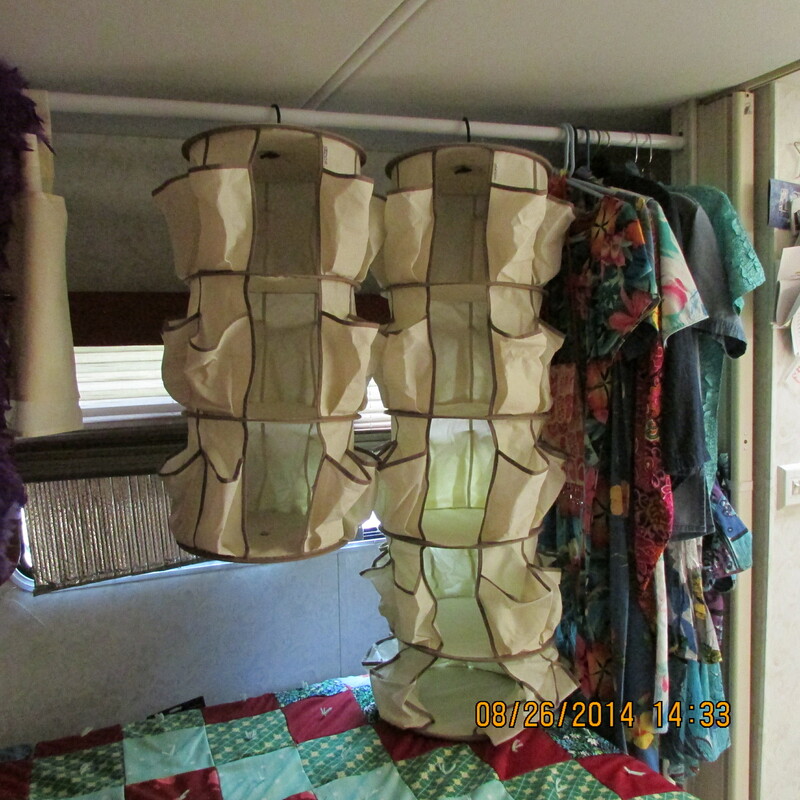 At Lowe’s, I purchased a clothes pole and mounted it over the back-side of my queen-size bed. Now: purses, hats, and other accessories are neatly stored. I haven’t been idle; things have been accomplished. But I’m an unhappy old lady because I prefer to spend time in the yard–and so many projects need my attention!! I’m told the weather will not cool off until October!! On the bright side: My property was not damaged by an earthquake (like the Napa Valley of California), nor destroyed by fire like an area near Yosemite National Park. We aren’t suffering a draught like California; we haven’t suffered flooding like recent unusual weather in New York and New England states. Counting my blessings!!!!!!!!!!! I’ve conserved my energy today for square dancing tonight. … the details in this attached news article.